Kalashnikov AK-12 assault rifle, prototype that originally participated in “Ratnik” trials. The 5.45mm Kalashnikov AK-12 assault rifle (GRAU index 6P70 / 6П70) is a new weapon which is intended eventually to replace previous generations of 5.45mm Kalashnikov assault rifles (AK74, AK74M) in service with Russian and other governmental forces. The AK-12 project was commenced in 2011 by the IZHMASH arms factory (now part of the “Kalashnikov” concern) as a private venture. In 2013 it was entered into the “Ratnik” trials which were held by the Russian army. The goal of the “Ratnik” trials was to select a new combat kit for Russian Special forces, which, besides other items, includes 7.62mm and 5.45mm assault rifles of modern design and increased effectiveness. During these years, the AK-12 rifle went through several modifications. Early guns, developed between 2011 and 2013, were designed by Vladimir Zlobin, former senior small arms designer at Tula Sporting and Hunting arms design bureau (TsKIB SOO), who was invited to work in Izhevsk in 2010. His rifle, while looking slightly more modern and ‘trendy’ than existing AK variants, ultimately failed Ratnik trials. In 2015 an official report stated: “..the manufacturer can try to solve the many problems with reliability, durability and high production costs, but only at its own expense”. By this time, the newly established “Kalashnikov” group, incorporating IZHMASH as its essential part, had new leadership. A decision ultimately was made to retire the failed design and its chief designer, and to get back to work developing a weapon that would be better suited to existing manufacturing processes, while also capable of fulfilling the requirements of the ‘Ratnik’ program. A new development team led by the current chief designer of the Kalashnikov group, Sergey Urzhumtsev, was appointed in 2014. Starting with the proven solutions of the ‘hundred’ series of Kalashniikov rifles (AK74M etc) his team ultimately produced a prototype, internally designated as AK-400. This weapon performed rather well during a second round of official trials and tests. In early 2016 it was approved for initial batch production and field trials in two versions, 5.45mm AK-12 (GRAU index 6P70 / 6П70) and 7.62mm AK-15 (GRAU index 6P71 / 6П71). Both versions were first displayed to the general public during the Russian Army-2016 expo in September, 2016. During field trials, which were held in 2016-2017 in different climate zones and with various troops (mechanized infantry, airborne, naval infantry and spetsnaz) AK-12 and AK-15 performed sufficiently well to warrant official recommendation for adoption by Russian army officials. This recommendation was formally published in January 2018, and by late 2018 the Kalashnikov group is expected to start deliveries of the mass-produced AK-12 and AK-15 rifles for the Russian armed forces. It must be noted that the primary rivals for Kalashnikov rifles during Ratnik trials were balanced action rifles, produced by the Degtyarov ZID plant and known as A-545 and A-762. Those rifles, which are noticeaby more expensive and more complex, were officially recommended for adoption by Russian Special Forces only. According to published statements, 5.45mm A-545 balanced action rifles are about 10% more effective than AK-12 at ranges of up to 300 meters and when firing 2-round bursts. At longer ranges, AK-12 holds the edge over its competitior by about the same margin (10%), thanks to its better single shot accuracy. The Kalashnikov concern also offers compact versions of both rifles, known as AK-12K and AK-15K. These weapons are well suited for CQB use by Special Forces or as personal defense weapons for vehicle and heavy armament crews. Another development that stemmed from the latest version of the AK-12 rifle is the RPK-16 light machine gun / squad automatic weapon. Kalashnikov AK-12 and AK-15 assault rifles have traditional Kalashnikov-type gas operated action with rotary bolt locking, and use magazines compatible with previous generations of 5.45mm AK74 or 7.62mm AKM and AK103 rifles respectively. In all other respects these rifles are similar. The receiver, gas block, gas tube and barrel are redesigned to achieve better accuracy under all conditions. The gas tube is permanently attached to the receiver and has a removable plug at the front for inspection and maintenance. The forend is attached to the gas tube and the front of the receiver. This forms a stable and rigid platform for acessories as well as protecting the barrel from external stresses and bending, as the barrel does not touch the forend. The trigger and safety / fire selector unit is redesigned to provide three modes of fire, including single shot, 2-round burst and fully automatic fire, with familiar Kalashnikov-style safety/selector switch provided by an “index finger pad” to ensure faster and more convenient operation. 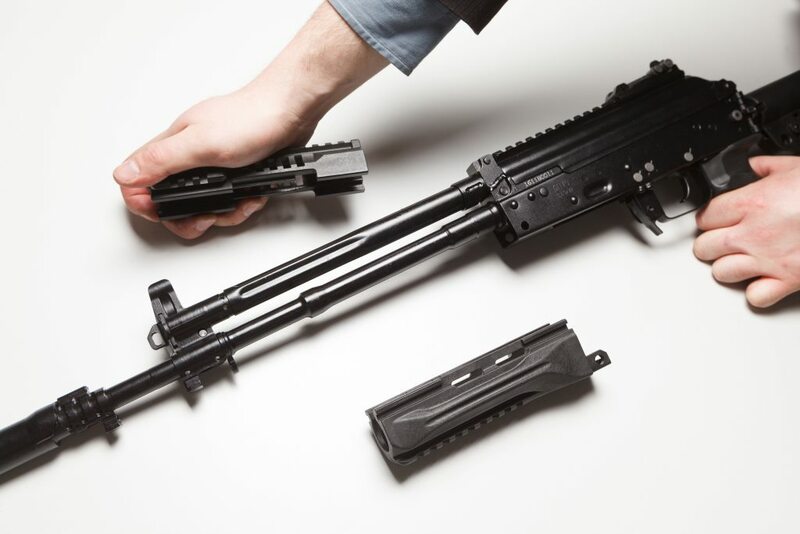 The AK-12 rifle is equipped with an integrated Picatinny rail on top of the redesigned, detachable top cover, which permits simple and fast installation of modern day and night sighting equipment. The top cover is attached to the receiver using a captive cross-pin at the front, and has a spring-loaded element at the rear to provide a stable platform with literally zero play or wobble. The forend is also equipped with Picatinny rails for various tactical accessories such as vertical grips, flashlights and IR lasers. The rifle is equipped with a side-folding shoulder stock which is adjustable for length of pull. This shoulder stock is of a very strong design, allowing the extensive use of an underbarrel grenade launcher such as a GP-25 or GP-34, further increasing combat effectiveness. Iron sights consist of a shrouded front post, mounted on the gas block, and an adjustable rear aperture sight, installed on a removable base using the upper Picatinny rail. The barrel is provided with an effective removable compensator / muzzle brake. Depending on the tactical situation, a bayonet or quick detachable sound suppressor can be mounted on the barrel. 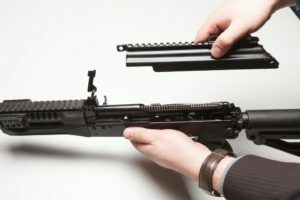 There is a cleaning kit stored inside a container at the base of the pistol grip, and a three-piece cleaning rod stored inside the shoulder stock tube.